The wall of this outreef is covered in healthy hardcorals. While descending we reach the fantastic big cave. Opening like a cathedral underwater, the roof of the cave starts at about 21 m, while the bottom reaches 28 m. The walls are covered in blue softcorals and gorgonias. Big groupers, napoleons and turtles rest in the cage. The light shining down at the edge of the cave gives you an spectacular view. Take a torch and explore the corners and the magical life inside the cave. You find little shrimps and sometimes nudibranches. Outside the cave big tunas and jack fish hunt the swarm of fusiliers, red tooth triggerfish and snappers, but also sharks and eagle rays are often seen. The shallower reefparts offer also some smaller overhangs to explore. Because of the depth, the huge cave is just for advanced divers, but the reef offers multiple options to be a fantastic dive for everybody. We jump near the cave depending of the direction of the current. Inside the cave you are very good protected from current. We spend time to explore the cave, and then we exit the cave and make our way with the current to the shallower parts of the reef. The west side of this long reef formation is the outer reef off the atoll, and the north is located in the channel. The reef top is shallow with only 5 to 8 m and has many big coral blocks with fascinating fish life. The west corner slopes down to greater than 30 and will impress you with nice overhangs and terraces. Big tunas pass by and napoleon and sharks cruise around. On the nose of the corner there are often hundreds of black snappers around you. Barracudas and big napoleons are common. Triggerfish, snappers and fussiliers swarm around. The north side forms a steep slope and is home for many small things hiding in the corals in depths between 10 and 15 m. There you will meet up with a lot of colourfull reef fish, turtles, stingrays, moray eels, lobster and creatures like shrimps and crabs, and for good observers, big scorpionfish camouflageing between the corals. Depending on the strength of the current it needs a little experience to stay directly on the corner where the most fishlife is around. Beginners can just drift with the current along the wall. Also a shallow dive profile possible. 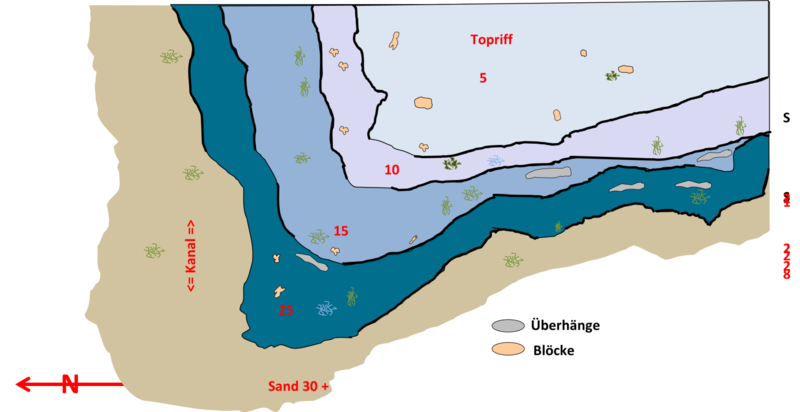 With an IN going current we start our dive at the outer reef close to the corner and spend a while at the split point. Have a look into the blue water and wait for the big stuff to pass by. After that, we continue our dive right shoulder to discover the north side. Do not forget to search in the blocks for the small things. Spend your safety stop at the shallow reef top and enjoy the fish life. If the current is running OUT, we start at the north side, reach the corner to enjoy the big stuff and end up drifting along the rich western part where we can enjoy some overhangs and caves. Rocks is a dive to explore different large blocks of coral at about 25 minutes navigation north-east inside the atoll. 25 minutes navigation north-east inside the atoll. This reef is an elongated ridge with many different small coral gardens and blocks. The blocks present a various biodiversity, some of them widely covered in soft corals. Hard corals like Acropora,Pocillopora and big Porites give shelter to sweetlips, squirrelfish and big moray eels, and are often surrounded by incredible swarms of glassfish of more than one species. Being close to vast sandy areas, the site gives good chance to see very big stingrays and fantail rays buried in the sand or sliding over the bottom looking for preys. During the right season, when the plancton reaches high concentrations in the area, this is a good site for Mantas. So in this case always keep an eye above you while diving over the blocks! Very simple and relatively shallow dive - something for everyone. But if we must have a strong current you can deal with it in order to really enjoy the place . We just jump over one of the blocks and circle it to explore all its points, then we can cross the sand and head to another block. We will be able to see the next block even with poor visibility, so just have a look at your compass and enjoy. First channel north of Kanifushi, at 15 min navigation. In this divesite is quite easy to spot Honeycomb Morey eels bulging from the holes in the wall at medium depths. If you look at the blue, you will be able to see tunas and batfish passing by, and you have good chance of running into a solitary Napoleon. Approaching the sandy area at the corner of the reef, we can expect to see very large stingrays buried in the sand, eagle rays swimming slowly, and, near the edge of the channel, some rare Oceanic Triggerfish. With the right current a very good place to spot some grey reef sharks! 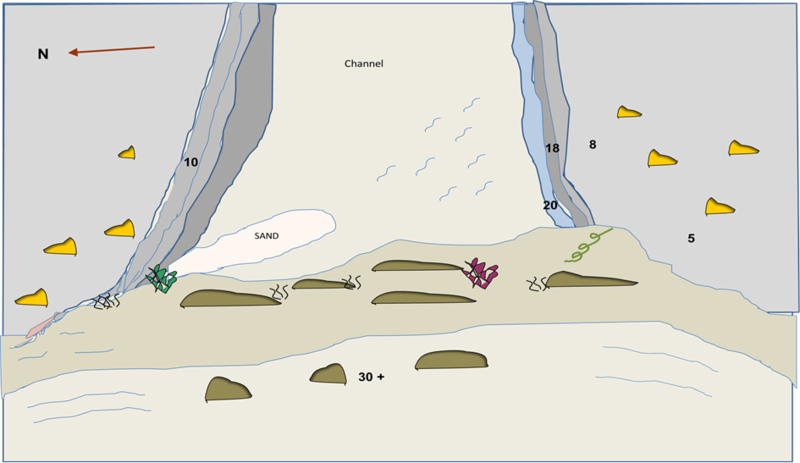 The plan is to keep the reef on our left shoulder and follow it southwards until reaching the corner; it is good to stay deep for a while, around 25 m. Once getting to the channel, we can ascend to the shallower step, at about 15-17 m, and turn around the corner keeping the depth, over the more sandy area where we can spot stingrays, eaglerays and triggerfish, to follow then the edge of the channel eastwards. Outreef of the atoll, 20 minutes navigation north. What makes this dive unique is the high chance of meeting some large Nurse sharks resting under big blocks of corals on the reef top! Some uncommon spotted hawkfish inhabit the hard corals on the top of the reef, as well as trumpetfish and anthias. Also, this is one of the rare places in which we find the nice Palette surgeonfish (to give an idea, the forgetful Dory of Finding Nemo! ), that you can see in small but very active schools over the corals blocks just few meters below the surface. Stamp corals and some big soft corals characterize the wall after the first meters, and swarms of small redtooth triggerfish hovering or hiding in the holes. Very often we find 3 - 4 very big napoleon wrasses in the wall. At about 20 m we find beautiful overhangs and small caves along the whole reefside, inhabited by a huge solitary marble grouper. The dive is affordable for everybody; we just need to be aware about the intensity of the current. Excellent for beginners who prefer to stay shallow.. The jumping point is above the block where we usually find the Nurse sharks, although they sometimes chose other blocks nearby, that we will make sure to visit anyway. We will drift over the reef top for a while, just to enjoy what the shallow depth offers. Then, we'll start heading the reefcrest to start our descent: we can reach good depths such as 25-27 m and explore the wall caves. Our safety stop will be again over the reef top, to end our dive with great satisfaction. Second Reef channel, about 25 minutes north of Kanifushi. On this divesite you find a lot of Overhangs and little Caves, beautifully alive with Gorgonias, black Corals and lightblue Softcorals. The Reef slopes from a top of about 5m down to the sandy bottom at about 35 m. The channel edge opens at 14 m with a big sandy plateau full of Garden Eels. Often you find big feathertail stingrays resting in the sand. Directly under the channel edge is a beautiful overhang protected from the current. Experienced divers can cross the channel under the edge and enjoy two fantastic caves with swimmthroughs at about 22 meters north and south of the channel. Perfect dive for the big things like Napoleon, Eaglerays,Tunas and sharks. Schools of Barracudas and Batfish are common. Turtles rest in the overhangs and big shools of Reeffish surround you during your dive. This reef has something for everybody, from beginner to experience. Be aware that crossing the channel implies facing quite important current. We start on the outer reef and go with the current heading to the channel corner. Experienced divers can enjoy the bigger Caves in the depth, while we drift with beginners along the reefside until we reach the channel corner and enjoy the garden Eels and the swarming fishes. With experienced divers we cross the channel, and go shallower to end up on the opposite channel edge and enjoy the spectacular Fishlife of shallower depths. Südliche Ecke des Vavvaru Kanals - 30 Minuten nördlich. An amazing variety of coral - and fishlife will impress you on this beautiful channel dive. On the edge of the channel you will find a large number of different shaped terraces that are beautifully grown with sponges and softcorals. Easy to spot nudibranches and moray eels. On the deeper terraces you also find anemones with the very rare found porcelain crabs. But also these terraces are the right place to rest for the amazing variety of pelagics, which pass by this channel. Eagle Rays and grey reef sharks are often found cruising around at about 25 m. Large stingrays swim also by, or rest on the terraces. Big schools of snappers and fussiliers hang around the corner. The outreef wall is a nice drop-off covered in very healthy hardcorals. Depending on the strength of the current it needs a little experience to reach the deeper terraces where the most fishlife is around. Beginners can just drift with the current along the wall. Also a shallow dive profile is easily possible. Depending of In - or Outgoing current we jump on the outreef, or in the channel. Reaching the terraces we stay there and enjoy looking into the blue. Reaching our bottom time, we ascend slowly and drift into the channel or outside on the wall to do our safety stop. North of Vaavaru Island, about 30 minutes navigation from Kanifushi. The reef is a big vertical wall from 7-8 m down to more than 30 m, with several overhangs and small caves between 21 and 27 m where sweetlips and some big squirrelfish rest or hide, and at the edge of the caves it is easy to spot nudibranches. During your dive take a look inside the many holes on the wall as you will find shrimps and blennies hiding inside, beside many moray eels of different sizes and species. What is unique on this divesite is the very big number of anemones and their clownfish partners just before reaching the corner of the faru, between 16 and 10 m. The area is made even more colorful by the numerous anthias hovering in the current. Also, large schools of fusiliers, yellow snappers and oriental sweetlips, and big jacks hunting make a lot of exciting action. The dive is suitable for every level, since a deep plan is advisable at least for part of it, but a shallow profile is also definitely enjoyable and easier. With an IN going current we'll start our dive from the north-west facing wall heading south and keeping the reef on our left shoulder, until reaching the corner, where the current starts to increase and we find more action, and we can stop observing the numerous anemonfish between 16 and 10 m. It is worth spending the first part of the dive at a good depth of 20-25 m, where small overhangs give shelter to sweetlips and jacks, and we can spot nudibranches or other tiny stuff like blennies. 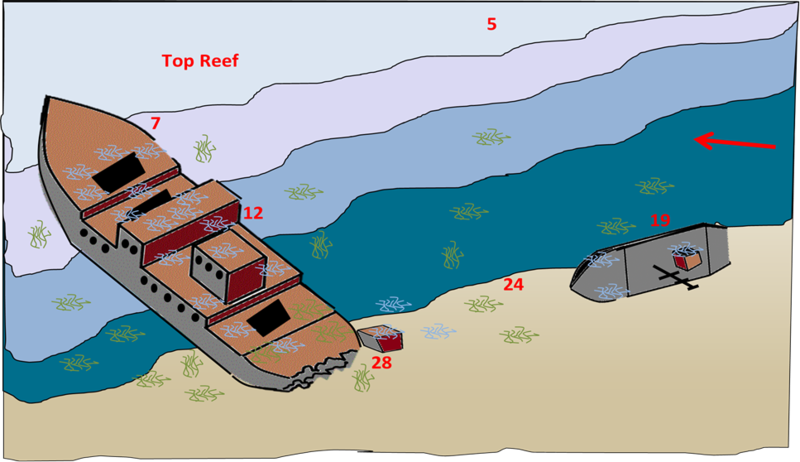 Depending on our air consumption, we can continue drifting along the southern wall, just inside the channel; otherwise, let's make our safety stop at the reef top. In case of OUT going current, our start point will be inside the channel, and we will head west keeping the reef on our right shoulder. About 1 hour navigation northwards along the edge of the atoll, after the local island of Naifaru. The reef is rich in stamp corals and hard corals building up big formations at any depth. Over the reeftop you will find a busy life of reef fish such as any kind of wrasses, rabbitfish and butterflyfish, as well as trumpetfish and needlefish. Going deeper, the wall is inhabited by more than one species of dartfish, which you can spot hovering at the entrance of their nest; leopard morays, triggerfish, and small shy tobys. Also, schools of large batfish and solitary fast swimming tunas are usually seen. The wall has some nice caves where the quantity of glassfish is impressive. Look for fan corals, and you will maybe discover some nudibranches walking nearby. This reef also hosts anemonefish of both species found in the Maldives. Garden eels can be seen where the wall slopes into the sand, below the 25 m depth. Of course as a channel, the site is good to spot sharks, eagle rays, tunas and barracudas passing in the blue. This fascinating dive is suitable for all divers, as long as you respect your limits. Our entry point will be at a medium position along the wall, so that we can choose our direction depending on the current: left shoulder with OUTgoing current, right shoulder in case of Ingoing current. We simply drift along the wall, starting, when allowed by the license, from 20-25 m, and ending our dive over the reeftop, to observe the colorful corals and the animals buring or feeding into the sand. Near the corner, if we find nice and strong current, we will stop and hang to the reef to wait for sharks and eagle rays passing by. At about 50 minutes navigation north of Kanifushi, the site is the reef enclosing the local island of Naifaru, capital of Lhaviyani atoll. The reef is a big wall sloping down to more than 30 m, rich in hard corals and good for small things lovers, like divers with a camera. Beside table corals, branching Acropora and massive porites, many soft corals gorgonia-like or tree-like stud the wall, providing colors and perfect subjects for macro pictures! If you spend a bit of time looking between the corals, you will find very tiny gobies or dwellers inside their nests, while swarms of Anthias and Maldivian fusiliers will surround you. Heading to the corner of the barrier, the reef forms some wide terraces, so that you can explore different depths according to your taste. As the island hosts a small Center for turtles rescue, you can hardly miss at least a Green turtle swimming by. A quite easy dive for everybody, not too much affected by current or waves. The dive will be along the western part of the island. 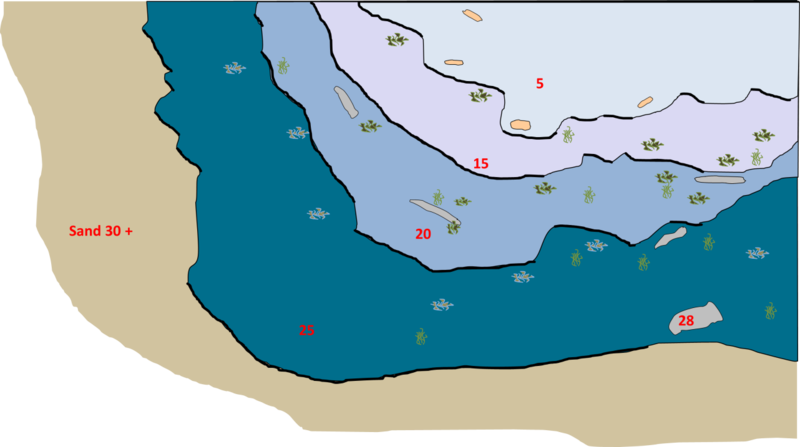 The wall follows a North-South axis, so depending on the direction of the current we will jump more northwise or southwise and will keep the left or right shoulder, drifting along the whole wall. The dive site at Felivaru has two Japanese shipwrecks that were sunk by their owner in 1980. They are situated in the west side of the Lhaviyani Atoll, inside the channel that separates Felivaru from Gaaverifaru. This diving spot is easy to find as a bowsprit from one of the wrecks protrudes five meters above the surface. Both wrecks rest about 30 meters down on the seabed and are similarly separated 30 meters apart. The wreck that protrudes has its stern on the seabed and the starboard leaning against the wall of the pass whilst the other is lying vertically on the seabed. The shipwrecks at Felivaru are completely covered with coral and alcyonarians and reduced diving has preserved the site well. A common way to reach the dive site is by safari boat. Once reached, it will be possible to see huge amounts of glassfish, coral groupers as well as schools of angelfish and batfish. Nurse sharks, reef sharks and morays also make the visit from time to time. With outgoing current we jump over the second wreck and descend along to wall to explore this wreck at about 20 m Spend some time there, it`s worth to lock! Following the wall the current takes us to the bigger wreck. We explore the wreck from deep to shallow. With Incoming current we jump over the bigger wreck and then, we can descend along it to go deeper: have a look into the several windows of the wreck. The stern of the ship lays on the bottom at about 30 m. The flanks of the ship are not as much interesting as the rest, so just visit them if you really have some spare time. This divesite is about 40 minutes east of Kanifushi Island. Very interesting corner with a very rich topreef. A huge amount large Rocks full of holes and places to hide for a large variety of reeffish. You find a lot of morays, lobsters and shrimps in the blocks. Also we find nearly every time big nursesharks resting under the rocks. An amazing experience because they let you come very close. Also a good place to spot mantas on several cleaner stations on the topreef. The wall is sloping down to 30 m with a large variety of sponges and hardcorals. Some beautiful blocks around 25 m are fully covered in softcorals and glasfishes. Spot nudibranches and shrimps in the several small overhangs. The fishlife on the corner can be very rich with a medium to strong current. Outside in the blue you have a very good chance to spot eagle rays and tunas. Capable dive for every Level. Beginners enjoy the topreef, while experienced divers explore also the deeper parts of the slope. Depending on the current of the outreef we jump directly on the corner or further west on the topreef. Spend several minutes on the topreef between 5 and 10 m and search in the rocks for the nursesharks, then descend and drift with the current along the reef. With a strong incoming current we sometimes have a nice splitpoint at 18 - 25 m where we can rest and enjoy the big stuff around us. Very western end of Kanifushi house reef, reachable in no more than 15 min by boat. The dive site is really facing the open ocean, out of the atoll and you will feel that. Chance to spot the typical pelagic life: tunas, barracudas, eagle rays and some reef sharks, and in the season, mantas swimming by in the blue. Gently sloping down to 30-32 m, the wall offers the best profile at medium depth from 14 to 18-20 m: it presents many weirdly shaped blocks of corals protruding out and behind which is very usual to spot moray eels, lionfish, lobsters, and very often green turtles resting under the larger ones. We will see several beautiful anemones inhabited by clownfish of both species found in this atoll (Maldives and Clark's clownfish). A school of really huge Giant sweetlips ordinarily dwells along this reef, as well as some uncommon Checkboard snappers, not found anywhere else in the area. Be ready to expect medium current, however necessary to give us more chances to see big stuff swimming outside the reef! A part from that, it is an easy and relaxing dive along the wall, that anybody, from beginners to very expert divers, can enjoy at full blast! Depending on how the current is splitting at the corner of the island we can start our dive either from the western wall or directly from the southern wall of the reef, keeping the barrier on our left or right shoulder, and drifting with the current. We can have a look down at 27-29 m, however we prefer to keep a shallower profile, since this wall is most enjoyable above 20 m.
A big reef after the local island of Madivaru, about 50 min by boat, in the northern part of the atoll. The reef, a steep wall reaching more than 30 m depth, presents many caves of all shapes and sizes, and nice swimthrough, which you can explore one by one to find as many species of marine life as you wish. The wall is encrusted with sponges of all colors, in turn covered by bunches of soft corals of all sizes, tunicates, crinoids and colorful algae. Also hard corals present a wide variety of shapes and colors, many with visible tiny polyps beautifully open in the current. Schools of fusiliers, anthias, big surgeonfish, wrasses and butterflyfish dominate the barrier, while you will spot large stingrays and pufferfish resting inside the caves. Also look there for turtles, napoleons and stonefish! Facing the outside of the atoll, this dive offers good chance to see pelagic life passing by: reef sharks, eagle rays, barracudas, tunas. The dive is affordable by everybody. Beginners can enjoy the upper part of the wall, while more expert divers will explore the depths. The plan is to just drift with the current along the wall at the preferred depth. So, according with the direction of the main current, we jump approximately at a midpoint and drift keeping the reef on the right shoulder if heading north, otherwise on our left shoulder in case we head south. Outreef of the atoll at the inhabited Veyvah Island, south of Naifaru. About 30 minutes by boat. The reef, a steep wall reaching more than 30 m depth, presents many caves in the area between 18 and 30 m, and nice swimthroughs which you can explore one by one. Some of them reach immense sizes in length and height. Inside this caves you find yourself in another world. Take a torch and explore the deep areas. Often we found sleeping napoleons in the caves. The wall is encrusted with sponges of all colors, in turn covered by bunches of soft corals of all sizes, tunicates, crinoids and colorful algae. Also hard corals present a wide variety of shapes and colors. Schools of fusiliers, anthias, big surgeonfish, wrasses and butterflyfish are found around this wall. Facing the outside of the atoll, this dive offers good chance to see pelagic life passing by: reef sharks, eagle rays, barracudas, tunas. The dive is affordable by everybody. Beginners can enjoy the upper part of the wall, while more experienced divers, especially with nitrox will have many time to enjoy the deep caves. The plan is to just drift with the current along the wall at the preferred depth. So, according with the direction of the main current, we jump and drift keeping the reef on the right shoulder if heading north, otherwise on our left shoulder in case we head south. This long reef formation is the outer reef off the atoll. The reef top is shallow with only 5 to 8 m and has some big coral blocks with fascinating fish life. The corner slopes down, at 20 m a small terrace starts, that’s go down to greater than 30. Big tunas pass by, barracudas and sharks cruise around. On the nose of the corner there are often great numbers of black snappers around you. Red tooth triggerfish and fussiliers swarm around. The south side forms a steep slope and is home for many small things hiding in the corals in depths between 10 and 15 m. There you will meet up with a lot of colorful reef fish, turtles, stingrays, moray eels, lobster and creatures like shrimps and crabs. Capable dive for every Level. Beginners enjoy the shallow part, while experienced divers explore also the deeper parts of the slope. The north side of this giri is a slope down to a sandy bottom on 25m. We have a lot of small overhangs with good chance to see sleeping nurse sharks or lobsters. sometimes they are hiding behind millions of glass fishes so it`s difficult to spot them. A lot of moray eels are under the rocks there let themselves clean from the cleanershrimp. The topreef is full of blocks with plenty mass of fish life. Very easy and good for everybody. Depending on the current we follow the giri with the right or left shoulder. The best part is to start around 20 – 24 meters were you have the small overhangs and then go slowly to the shallow part and enjoy the amazing fishlife.